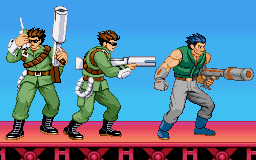 Radio sprite (2010): Bionic Commando for the NES is one of my favorite video games ever and I thought it was time to finally make a decent sprite of it's hero, Radd Spencer. I tried to sprite him almost 10 years ago but my skills weren't nearly good enough to make a good sprite from scratch. The radio pose is based on the NES screen shown when you complete a level in the NES game but he's standing. The progress sprite for the radio pose can be found below. Arcade stand (2012) & NES stand (2013): Though I'm not a fan of the arcade version, I still wanted to have that version of the Bionic Commando to be part of a 1987-themed ScrollBoss update. I used the legs as a starting point for the NES standing sprite I made less than a month later. The NES pose was one of the first fighting-scale sprites I'd ever tried to make from scratch back around 2001 or so and the results looked like crap. This one turned out much better.